I am wondering how accurate statistics really are and how much can I trust them. It is easy for me to observe my statistics because I know the truth, but how can I judge other traders. I have noticed this before just didn't go into details. Now that my original account is split on to two I don't have much data to process and here are the photos from one of the accounts. Examples are from one account. Some statistics are spot on and I will use those to analyse others. But not this two. Does Darwinex intervene into trades into such extent? Or is something else not working right? Consistency ( Dc R+ R- La ) works with positions. Trades on real account had higher pip losses and higher pip gains than what it is shown in statistic. It is 10-40 pip difference. That is quite a lot! Look first photo only. Indeed the 2 winning trades were one position. I don't see logic in statistic showing +12 and + 26 pips. What does this represent? How can I value this data? So I have left with questions. It is important to understand that, since reloaded -April 17-, bubbles in the R+ and R- no longer represent trades but positions in the same asset in the same direction -long or short-. 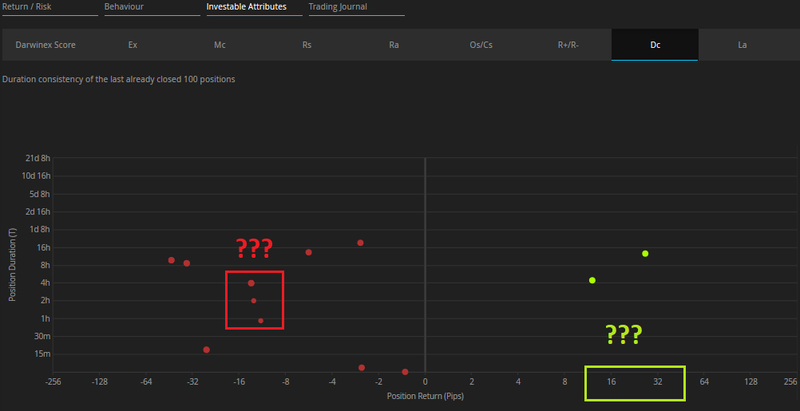 On the chart, you'll be able to see the last 50 positive & negative positions (same asset, same direction). Should you want to compare the current R+/R- chart with the “pre-reloaded” one in which bubbles represents trades instead of positions, please click on the “behaviour” tab and scroll down to the bottom where you'll be able to check the last 100 closed trades. I encourage you to read this brief article explaining the difference between a trade and a position. PS: sorry again for my late response. However, please take into consideration that Community is not the right place to DIRECTLY interact with Darwinex CST (Customer Success Team). Should you want to contact us for any particular reason, please please contact us at info@darwinex.com and we´ll provide you with a timely response next time. I will add yours and @JJENSLOPFAM answer from other topic. pips shown are pips normalized. That is you could have big difference depending the pair traded. Additionaly, and as explain by @JJENSLOPFAM, we normalize all pips giving them a 1.0000 unit value as if they we trading at parity. Meaning that It is not the same a pip in the EURNZD (1.6157) than in the NZDUSD (0.7241). When converted them to 1.0000, a pip in the EURNZD, at its current value, equals to 0.61 aprox whereas 1 pip in the NZDUSD, at its current value, equals to 1.38 pips. But the most important thing is the other if you trade with several trades in a pair at the same time, because in the chart of consistency today after reloaded is drawn the position. If you trade with only one, the pips are the difference between the exit and the open, but if you trade with more is the difference between every trade. For example, you open 1, after 10 pips (always normalized), you open the second, then it will draw a dot with 10 pips, after 2 pips you close the first with 12 pips, but the dot drawn it will be 2 pips, and after 15 pips you close the 2nd with 17 pips, but the dot will draw only 15.
bubbles in the R+ and R- represent positions in the same asset in the same direction -long or short-. 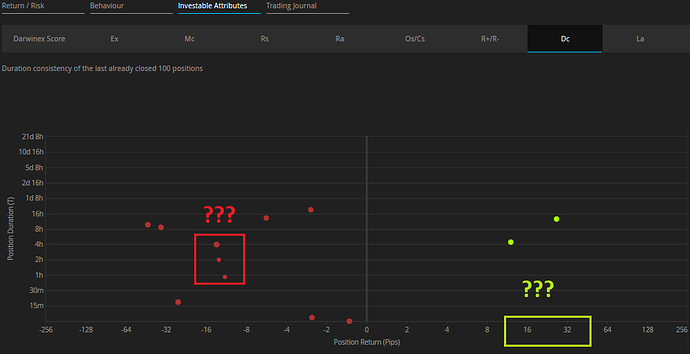 On the chart, you'll be able to see the last 50 positive & negative positions (same asset, same direction).